1.Preheat oven to 400°. Spray 13 x 18-inch rimmed baking pan with nonstick cooking spray. Place frozen waffles in single layer on prepared pan. Bake waffles 6 minutes or until thawed and slightly crisp. 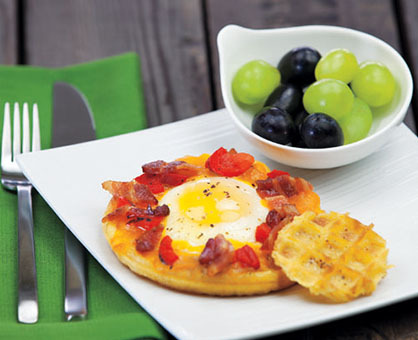 With 2-inch cutter (or glass with 2-inch opening), cut out center of each waffle; place centers on pan with waffles. 2.In small microwave-safe bowl, cook butter in microwave oven on high 30 seconds or until melted. Crack 1 egg into center of each waffle; drizzle butter and sprinkle salt and pepper over waffles with eggs and waffle centers. Bake 4 minutes. 3.Sprinkle cheese, then peppers and bacon over edges of waffles around eggs. Bake 3 to 4 minutes longer, or until edges of waffles are lightly browned and cheese melts. Serve immediately.